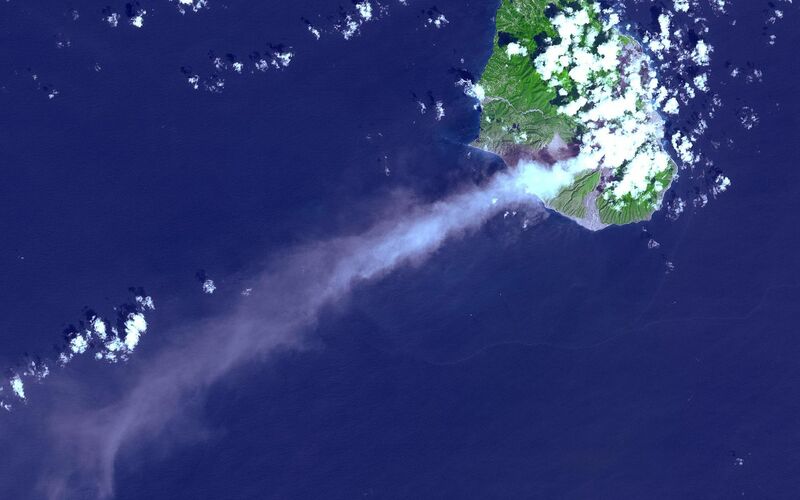 In this ASTER image of Soufriere Hills Volcano on Montserrat in the Caribbean, continued eruptive activity is evident by the extensive smoke and ash plume streaming towards the west-southwest. 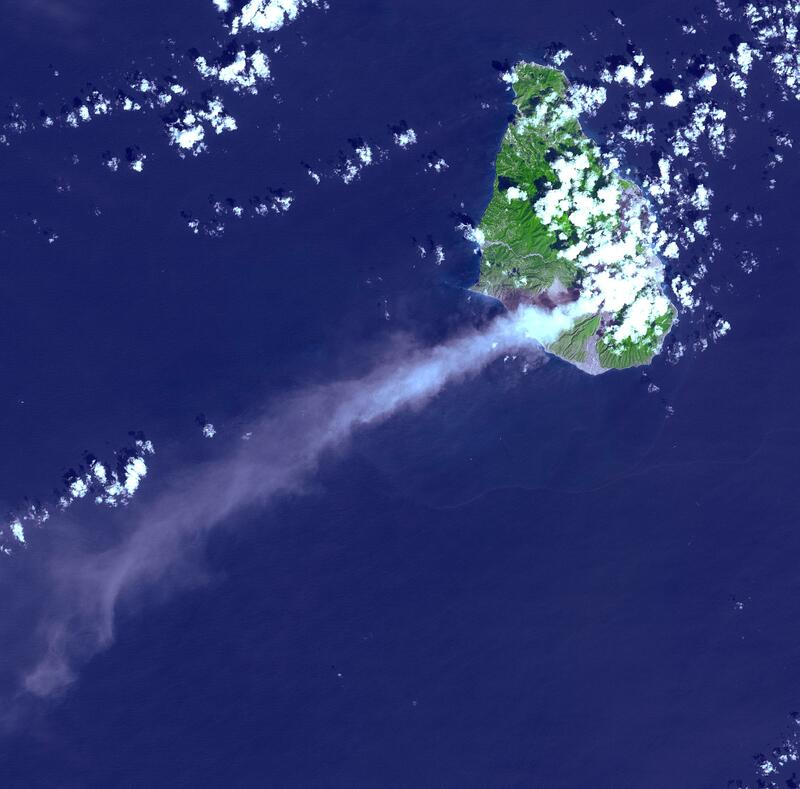 Significant eruptive activity began in 1995, forcing the authorities to evacuate more than 7,000 of the island's original population of 11,000. The primary risk now is to the northern part of the island and to the airport. 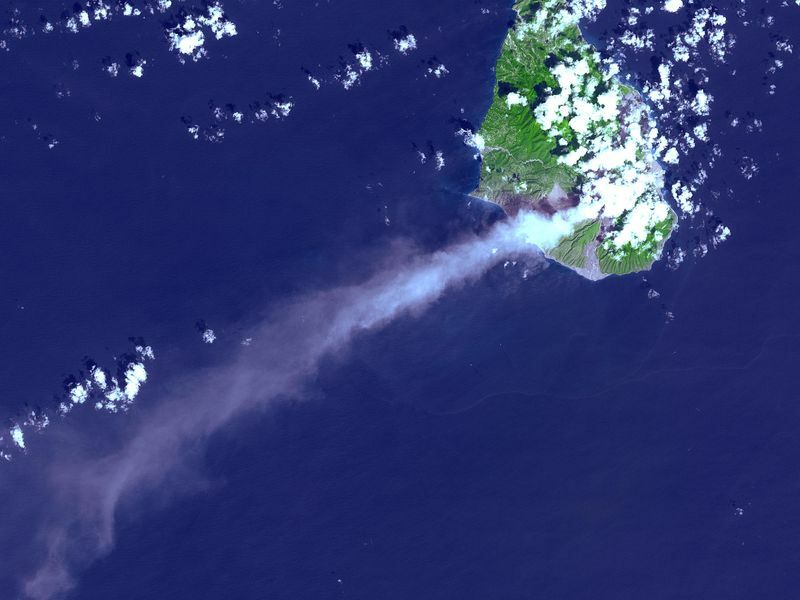 Small rockfalls and pyroclastic flows (ash, rock and hot gases) are common at this time due to continued growth of the dome at the volcano's summit. 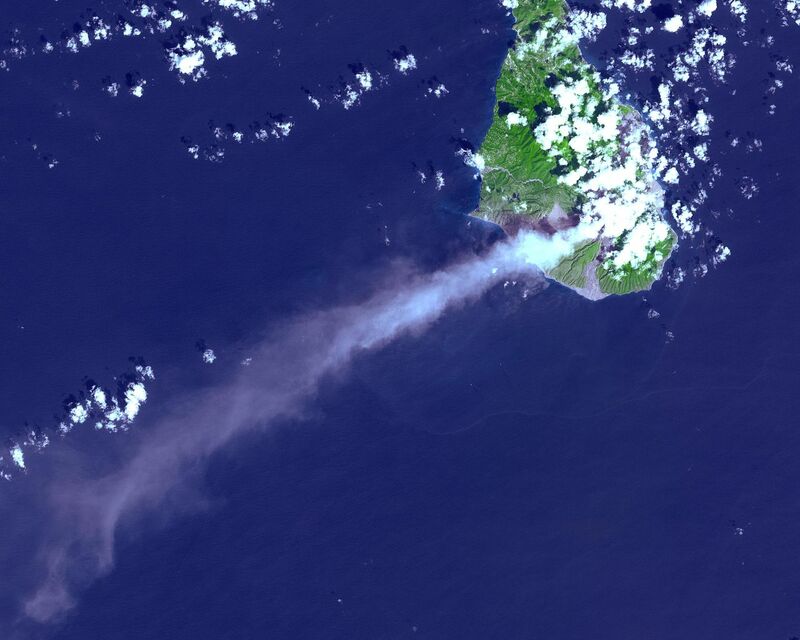 This image was acquired on October 29, 2002 by the Advanced Spaceborne Thermal Emission and Reflection Radiometer (ASTER) on NASA's Terra satellite. With its 14 spectral bands from the visible to the thermal infrared wavelength region, and its high spatial resolution of 15 to 90 meters (about 50 to 300 feet), ASTER images Earth to map and monitor the changing surface of our planet. ASTER is one of five Earth-observing instruments launched December 18, 1999, on NASA's Terra satellite. The instrument was built by Japan's Ministry of Economy, Trade and Industry. A joint U.S./Japan science team is responsible for validation and calibration of the instrument and the data products. The broad spectral coverage and high spectral resolution of ASTER will provide scientists in numerous disciplines with critical information for surface mapping, and monitoring of dynamic conditions and temporal change. Example applications are: monitoring glacial advances and retreats; monitoring potentially active volcanoes; identifying crop stress; determining cloud morphology and physical properties; wetlands evaluation; thermal pollution monitoring; coral reef degradation; surface temperature mapping of soils and geology; and measuring surface heat balance. Dr. Anne Kahle at NASA's Jet Propulsion Laboratory, Pasadena, California, is the U.S. Science team leader; Bjorn Eng of JPL is the project manager. The Terra mission is part of NASA's Earth Science Enterprise, a long- term research effort to understand and protect our home planet. Through the study of Earth, NASA will help to provide sound science to policy and economic decision-makers so as to better life here, while developing the technologies needed to explore the universe and search for life beyond our home planet. Location: 16.7 deg. North lat., 62.2 deg. West long.